What if you bought this comic? "Twice Told Tales of Interest" is the twenty-fourth comic issue and the first Anthology of Interest comic issue, which was released 22 March, 2006 in the US. Bender is playing poker at the Planet Express workbench, and since Fry is asleep, Bender decides to take advantage of him, and soon Fry is broke. Leela confronts Bender and tells him not to take advantage of Fry, so Bender then builds a robot out of the What If? machine so that he can have a poker buddy. Fry wakes up, and unawarely asks a What If? question (What if it was Xmas every day?). The What If? machine reveals his programming which forces him to reveal the answer, and then we are shown what it would be like if it were Xmas every day...Nixon makes a deal with Robot Santa so that he can be head of weapons if it is Xmas every day. Soon, everyone on Earth is enslaved into Santa's army. Leela gets the Professor to build a giant Easter Rabbit robot, and soon they (as well as Amy, thanks to her clumsiness) destroy Santa. Leela decides to ask the next question, but Bender, being selfish, asks the machine "What if we skip Leela's question?". 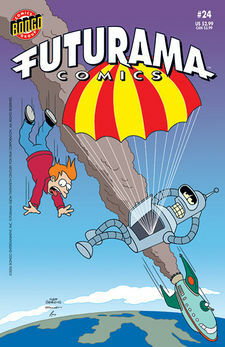 Fry decides to ask the final question, so he asks "What if life were like a sitcom?". In a parody of "I Dream of Jeannie", Fry discovers a bottle containing a genie named Leela. He takes Leela home, where that night, she goes on a date. Fry doesn't want to be left alone, so he organizes a date with a witch named Amantha (Amy) (a parody of Samantha from "Bewitched"). Amantha and Leela soon have a fight, to which Fry becomes happy, since he's never had two girls fight over him before. Suddenly, the Professor arrives and tells Bender that the What If? machine has been using its software to cheat at poker, to which Bender says he installed an empathy chip so the robot would feel bad. However, the Professor then goes on to say it was really a self-destruct chip, and instantly the What If? machine blows up. The Professor complains that it'll take a year to rebuild. The What If? machine has been seen previously in the Futurama episodes "Anthology of Interest I" and "Anthology of Interest II", and in the comic "New Year's Rockin' Evil"
The Professor developed three similar machines for "How's about? ", "What's the deal with?" and "Who the hell wants to know?" questions. Fry: Aren't you going to end this with a witty remark or hilarious punchline that sums everything up? Amantha/Amy drops a 16-ton weight on Leela, a reference to a recurring joke in Monty Python's Flying Circus. Robot Santa says "I'm not fat--I'm big-bolted" a parody of Eric Cartman's "I'm not fat! I'm big-boned!" from South Park. In the Anthology of Interest episodes, the Planet Express crew had to manually turn the machine on after asking each question. In this story, the machine responds as soon as the question is asked. Although this may be due to the machine's robotic status in this comic.